A STAR-studded line-up of Taibhdhearc performers from past, present – and future - come together for the gala celebration [email protected] tomorrow, Friday October 26, and Saturday October 27, to mark the 90th birthday of ‘the grand old dame of Middle Street’. 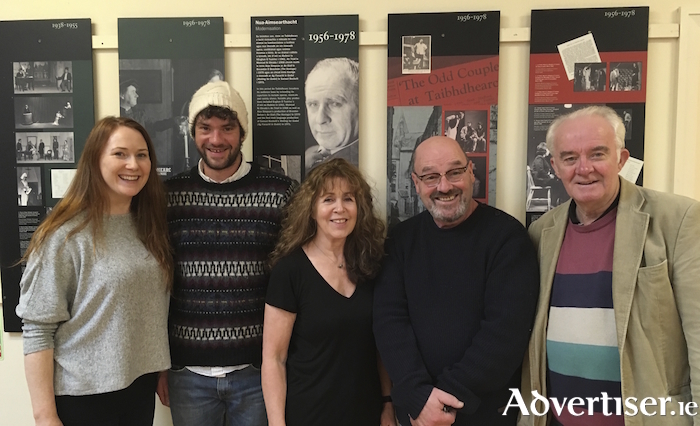 Actors Bríd Ní Neachtain, Macdara Ó Fátharta, Eoin Geoghegan, Sorcha Ní Chéide and Séamus MacCuinneagáin will perform excerpts from productions staged by An Taibhdhearc over the years,including Macdara O Fatharta’s adaptation of Máirtín Ó Cadhain's Cré na Cille, Mise Raiftearaí an File by Críostóir Ó Floinn, and San Siobhán (George Bernard Shaw’s Joan of Arc ), while the future generation of An Taibhdhearc actors will stage an extract from musical Annie. More than 30 members of Cantóirí na Taibhdheirce, under the baton of Paddy Daly, and accompanied by David Grealy will revisit highlights of the Taibhdhearc’s rich tradition of musicals and operas, many of which were translated by Máire Stafford, and directed by her husband Seán. Fittingly, [email protected] is being directed by Máire and Sean’s son, Maeliosa Stafford [pictured below], who has come home from Australia for the event. During a brief break in rehearsals he chatted with me about the show and the Taibhdhearc’s history, beginning with his own memories of the venue. Tickets for [email protected] are €20 and €15, with a package of €30 for those wishing to attend both performances. For more information see www.antaibhdhearc.com or call 091 - 562024.